Cleo Mathews accepted the Because of You Spirit of the Coalfields Award for her daughter, Sylvia Mathews Burwell, from West Virginia Senator Joe Manchin. The Because of You Educator of the Year award winner Joanne Jaeger Tomblin. 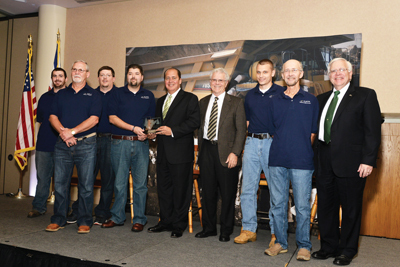 The Because of You Safety Professional Award was bestowed to the Pinnacle Blue mine rescue team. 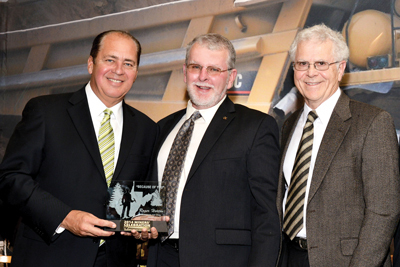 Roger Horton (center), winner of the Because of You Champion of Coal Award. The Because of You Homer Hickam Collier Award winner Delbert Weaver (second from left) along with Hickam, Tomblin and Kopp. 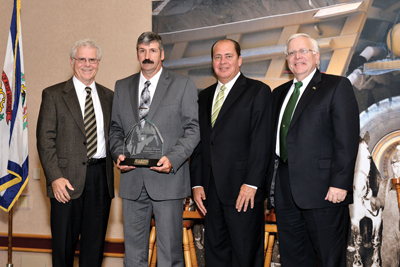 The 2014 Miners’ Celebration was held on October 2 in Beckley, West Virginia, and marked the achievements of several individuals and groups that represent the past, present and future of West Virginia coal mining. At the event, U.S. Secretary of Health and Human Services Sylvia Mathews Burwell was honored with a special Spirit of the Coalfields award, and Rocket Boys author Homer Hickam presented the Homer Hickam Collier Award to working coal miner Delbert Weaver. Because of You awards for significant contributions to West Virginia’s coalfields heritage were handed out in a number of categories, including community involvement to the Coal River East business unit of Alpha Natural Resources; Women in Mining to Tanya James of the United Mine Workers of America; Safety Professional to Pinnacle Mining’s Blue mine rescue team; Educator of the Year to Joanne Jaeger Tomblin of Southern West Virginia Community and Technical College; and Champion for Coal to Roger Horton of Citizens for Coal. The Coal Heritage Highway Authority/National Coal Heritage Area presented the Coal Heritage Award for Excellence in the Arts to West Virginia Dance Company for Fire in the Hole: A Coal History. The Coal Heritage Award for Interpretation was given to Layland Miners’ Memorial Group and the Coal Heritage Award for Research and Documentation was given to author Jay Chatman. The Miners’ Celebration is a cooperative project of the Center for Environmental, Geotechnical and Applied Sciences at Marshall University; the National Coal Heritage Area; Strategic Solutions; the United Mine Workers of America; the West Virginia Coal Association; and the West Virginia Division of Energy, Office of Coalfield Community Development. With a 40-year career of accomplishments in Canada’s coal industry, Boyd Payne is the 2014 recipient of the Coal Association of Canada’s (CAC) highest honor, the Award of Distinction. 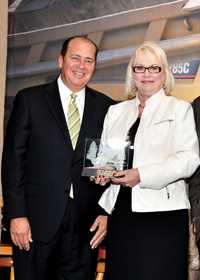 The award was bestowed on Payne on September 11 during the association’s international conference held in Vancouver.